Enhanced Abilities: Validus has vast super human strength and endurance, greater than even a Kryptonian. Invulnerability: Validus has a high degree of invulnerability. Mental Lightning: Validus can project blasts of mental lightning that are destructive to physical environments and to telepaths. Invulnerability – Telepathy: Validus is immune to all forms of telepathy. Validus was born to Lightning Lad and Saturn Girl, two of the founders of the Legion of Super-Heroes. Darkseid kidnapped Validus without his parents even becoming aware of his existence, mutated him into a monster, and sent him back in time 10 years. 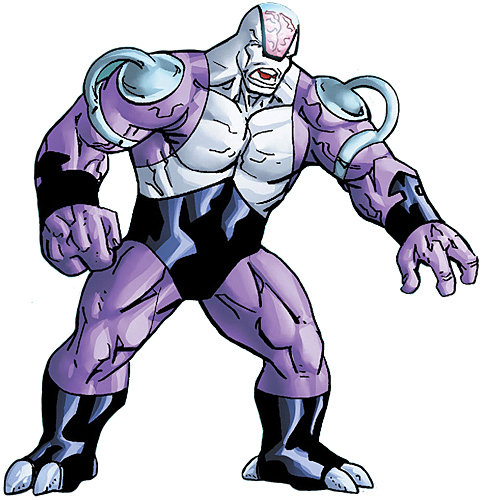 The mutated Validus remained a perpetual infant and became a galaxy-wide menace, and when he fell in the thrall of Tharok he joined the Fatal Five, becoming a deadly enemy of the Legion Of Super-Heroes.